The Ministry of Tourism reports that 290,000 tourists visited Israel in April 2008, an amount similar to that recorded in Israel’s record-breaking tourism year, 2000. The totals for this past April were 26% over April 2006, as well as 41% more than April 2007, when tourism was still negatively affected by the Second Lebanon War eight months earlier. During the first four months of 2008, 936,000 tourists arrived in Israel – an increase of 43% from the same period in 2007, and 34% more than the same period in 2006. The current pace of growth is consistent with Tourism Ministry goals to attract 2.8 million tourists to Israel this year. However, Tourism Ministry Director General Sha’ul Tzemach says that this blessing places in bold relief the increasing shortage of available guest rooms in Israel. When we were there in April, we could see the increase over 2006. We did not see quite as many Americans, but there were more tourists. Hotel space is difficult to get, and I hear that hotel prices are going up. Sort of like oil; the more they sell, the higher they price it! Disaster strikes! Or was it good fortune? My last photo with my Nikon D40X was made in the Roman agora at Thessalonica. When we arrived at the Athens airport we saw something that we thought our grandson would enjoy. I took out the trusty D40X, but it would not shoot. We made the photo with the standby Canon Power Shot SD630. At the hotel I discovered that all functions of the camera worked except the lense. I have a 55-200mm lense with me. When I put it on the camera everything worked perfectly. When I get back home I will head down to the Best Buy with my little warranty in hand to get this taken care of before another major trip. The lense I normally use is the 18-55mm. Most folks I talk with about cameras say they want to get a zoom, long-distance lense. Most of my photos are shot using the wide-angle feature. What a wonderful time for the camera to go out. Last shot on the last day of touring. I had noticed the camera seeming to have some difficult in firing for the past few days. Finally, it died. The camera is only about six months old, but it has been used for about 7000 shots. The Canon is a wonderful camera, but it has no viewfinder. This is all right for indoor shots, but it is very difficult to see the digital display in bright sunlight. I strongly advise that travelers get a digital camera with a view finder. Agora. We have mentioned the agora many times in these blogs. The agora (forum) was the marketplace of the Roman city. This morning we walked over to a gas station to get some water. I noticed the sign over the store read Mikre Agora. We would call it a Mini Market. The Capsis hotel in Thessalonica was our home for two nights. Wednesday we used our time visiting the city. Thessalonica (called Thessaloniki now) is in biblical Macedonia. The area is still known as Macedonia, but is not to be confused by the modern country by that name. It is marked on maps of Greece as FYROM (former Yugoslav Republic of Macedonia). I know too little about the dispute to make any comments. Paul came to Thessalonica on his second journey (A.D. 50-53; Acts 17). He wrote two letters to the church at Thessalonica while he was at Corinth. Aristarchus, a Macedonian of Thessalonica accompanied Paul on the voyage to Rome (Acts 27:2). When Demas forsook Paul he went to Thessalonica (2 Timothy 4:10). I went to the Archaeological Museum of Thessalonica thinking I would jump in, make a few shots of some items I had need of and then move along. In fact, I found a new (since my last visit in 2001) museum with wonderful educational exhibits, nice displays, and great lighting. 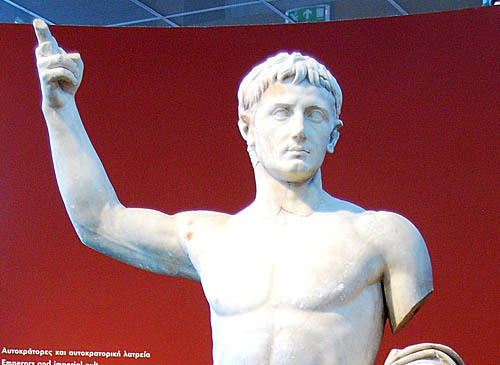 There is an impressive full-length statue of the Emperor Augustus (30 B.C. to A.D. 14). Augustus was emperor at the time of the birth of Jesus (Luke 2:1). Here is a photo of the top portion of the statue. This gives some indication of the wonderful lighting in the museum. This photo was made without flash. On the display around the statue of the emperor there is a statement about the cult of the emperor. In our travels in Asia Minor (western Turkey) we saw many evidences that the admiration of the emperor grew into worship of the emperor as a divine being. This placed a real burden on the Christians of the time. It is this type of tribulation that the book of Revelation addresses. The cult of the emperor was both an instrument of imperial policy progaganda and a means for the transmission of Roman culture. The image of the emperor gives a concrete form to the abstract idea of the Empire. Whether a full-lenth statue [as this one] of a bust, it makes his presence felt everywhere; in outoor and indoor spaces, in fora, in villas, and in libraries. 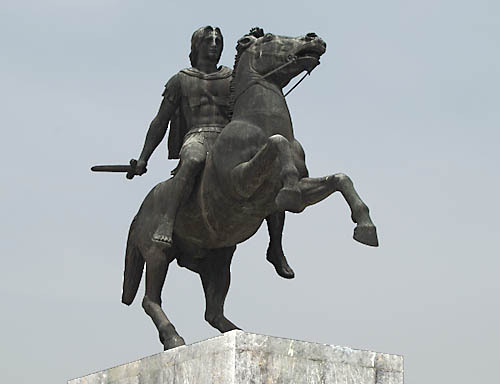 Elizabeth and I walked down by the harbor to see the colossal statue of Alexander the Great on his horse, ready to go into battle with sword drawn. We must put Alexander of Macedon among the most influential people of world history. His conquest of the areas we know as the Bible world continue to influence us till this day. He left his mark with the introduction of the oikumene concept of one world and the introduction of Greek culture and language. The Hebrew scriptures were translated into Greek in Alexandria beginning about 280 B.C. The New Testament was written in Greek. Even Paul, the Hebrew of Hebrews (Philippians 3:5), could speak Greek (Acts 21:37). We visited the Arch of Galerius on the modern Via Egnatia, one of the main streets of Thessalonca. I made a few photos in the Roman agora before we rushed to get our bags packed to fly back to Athens. By the time we arrived at our hotel, near the airport we had both decided that we were too tired to try to go to Delphi today. From our hotel room we are enjoying the beautiful view of a small town surrounded by mountains draped by blue sky with white clouds.